Spring is in the air, and things are abloom. Let’s be honest though: if you are a rehabber working on renovating a property, chances are you’ve not inherited a fragrant garden full of daffodils from the previous owners. You should consider yourself lucky if your backyard has not been used as a junkyard and does not contain dead pets (yes, we had a few of those). So how do you prevent your property from sticking up as a landscaping sore thumb without breaking your budget? Even more importantly, how do you increase its curb appeal in a way that is both quick and cost-efficient? Here are several time-tested tips that will save you time and money. Make sure that your scope of work includes all junk removal from your front and back yard. Ask your contractor whether he can also remove some dead branches, do basic de-weeding and spread some mulch in the flower beds and around the trees. It doesn’t require any landscaping skills and, since the crew is already on-site, might cost you less than bringing in a landscaping company. This is perhaps our favorite trick to make even modestly upgraded property look shiny and modern. 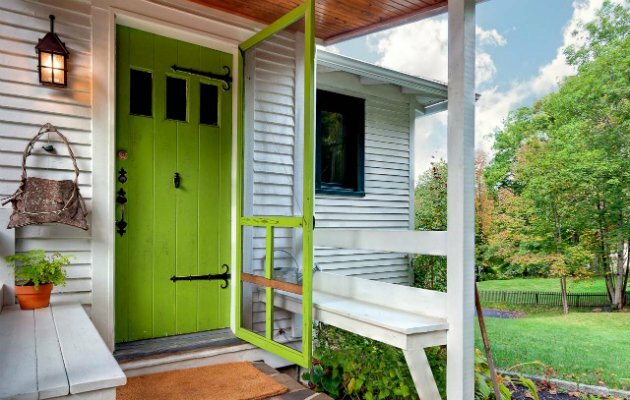 Don’t be afraid of vibrant front door color – embrace it for all its worth. Purple, royal blue, and red doors are guaranteed to improve your property’s curb appeal instantly. The best thing is that you can even salvage that old door – a coat (or two) of high-quality, bright paint will suffice. Replace old and dirty house numbers with larger and more modern version – there are plenty of choices on Amazon. Make them shine to deflect from other imperfections you might avoid fixing. Another trick that we use in properties with a modest rehab budget is to add a bright and plush front door mat. Spend an extra $15 and upgrade from the basic black or brown model. It would offer an additional focal point and color instead of more expensive fixtures. Instead of planting flowers, create an illusion of garden by strategically positioning a couple of flower containers around the most visible (or barren spots) in your front and back yard. Costco offers a variety of overflowing containers to cheer up any area – and at a bargain price. Make sure that you don’t position your containers in the full sun and that you have someone to water them at least occasionally. The last thing you want is a bunch of dead plants by your front door. Another way to add a character to a modest yard is to install a stepping stone path. It doesn’t have to be elaborate – five to ten nice-looking stepping stones might be enough to deflect from the dead grass. Do not underestimate the strength of curb appeal. It’s the first thing that your buyer sees, and it must set the right mood for the rest of the property. Hire a professional photographer to showcase its right features. Professional photographers will photograph your property in the right light, from the right angle, and with the right lenses to ensure it’s looking its absolute best. New Funding Resources is a private money lender that funds promising real estate opportunities in Maryland, Washington, DC, and Virginia. We work hand-in-hand with our borrowers to increase their profitability and reduce their risk. Whether you are a first-time real estate investor or a seasoned professional, together we will find ways to increase your ROI and to ensure your success.